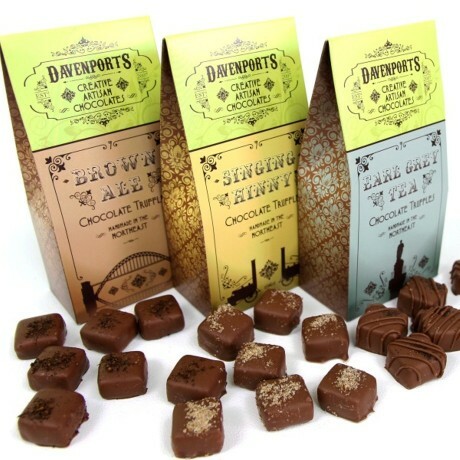 Our range of three North East inspired chocolate truffles, which celebrate flavours of the region make a perfect gift for anyone wanting to share a taste of the North East. 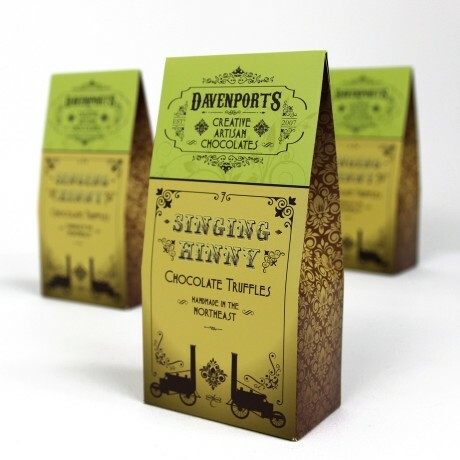 Singing Hinny - white chocolate truffles, dotted with raisins and shortbread crumbs and coated in milk chocolate topped with brown sugar. 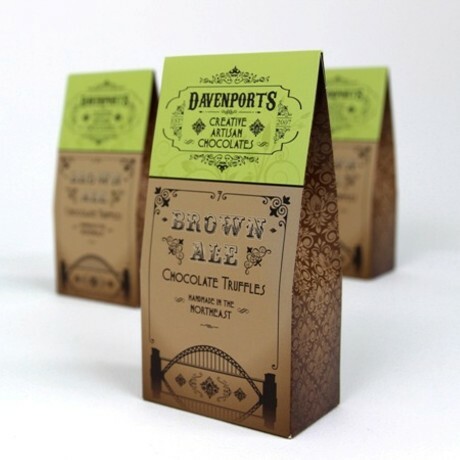 Brown Ale – Dark chocolate truffles, married with the distinct taste of brown malt, coated in milk chocolate, and topped with roasted malt to deepen the flavour. 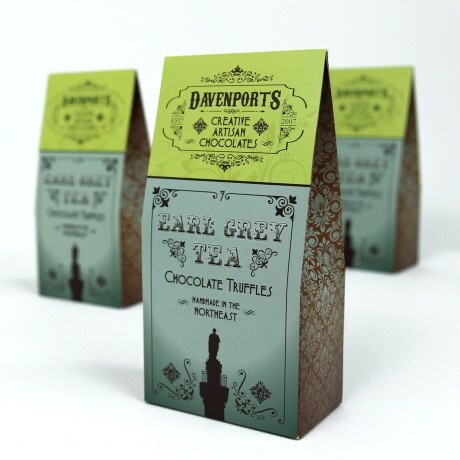 Earl Grey Tea – milk chocolate truffles, infused with the citrus and floral bergamot flavours of earl grey, coated in milk chocolate and topped with a sprinkle of slightly smokey tea leaves. Singing Hinny: White Chocolate (Sugar, Cocoa Butter, Whole Milk Powder, Cocoa Mass, Emulsifier: Soya Lecithin, Natural Vanilla Flavouring) (Milk, Soya), Shortbread Crumbs ( (Fortified Wheat Flour [Wheat Flour, Calcium Carbonate, Iron, Niacin (B3), Thiamin (B1)] , Unsalted Butter (Milk) (33%), Sugar, Cornflour, Salt . ), Cream (Milk), Water, Butter (Milk), Raisins (Sulphites), Cocoa Butter, Glucose, Soft Brown Sugar. Brown Ale:Dark Couverture Chocolate (cocoa Mass, Sugar, Cocoa Butter, Emulsifier: Soya Lecithin, Natural Vanilla Flavouring) (Milk, Soya), Couverture Milk Chocolate (Sugar, Cocoa Butter, Whole Milk Powder, Cocoa Mass, Emulsifier: Soya Lecithin, Natural Vanilla Flavouring) (Milk, Soya), Brown Ale ( (Water, Malted Barley, Glucose Syrup, Barley, Hops, Hop Extract)), Butter (Milk), Glucose, Malt Extract. Earl Grey Tea:Couverture Milk Chocolate (Sugar, Cocoa Butter, Whole Milk Powder, Cocoa Mass, Emulsifier: Soya Lecithin, Natural Vanilla Flavouring) (Milk, Soya), White Chocolate (Sugar, Cocoa Butter, Whole Milk Powder, Cocoa Mass, Emulsifier: Soya Lecithin, Natural Vanilla Flavouring) (Milk, Soya), Cream (Milk), Butter (Milk), Water, Glucose, Earl Grey Tea (teabags), Bergamot Oil. Singing Hinny:Per 100g: Energy 2184.5kJ, Energy 522.0kcal, Fat 34.6g (of which saturates 21.0g), Fatty Acids Monounsaturated 10.2g, Fatty Acids Polyunsaturated 1.0g, Trans Fatty Acids 0.4g, Carbohydrate 47.1g (of which sugars 42.9g), Fibre 0.8g, Protein 5.1g, Salt 0.26g, Sodium 102.5mg. Brown Ale:Per 100g: Energy 1911.5kJ, Energy 456.4kcal, Fat 30.5g (of which saturates 18.5g), Fatty Acids Monounsaturated 9.6g, Fatty Acids Polyunsaturated 1.0g,Trans Fatty Acids 0.3g, Carbohydrate 37.6g (of which sugars 34.1g), Fibre 4.2g, Protein 4.2g, Salt 0.15g, Sodium 59.2mg. Earl Grey Tea:Per 100g: Energy 2257.9kJ, Energy 539.5kcal, Fat 37.1g (of which saturates 22.5g), Fatty Acids Monounsaturated 11.4g, Fatty Acids Polyunsaturated 1.1g, Trans Fatty Acids 0.5g, Carbohydrate 45.1g (of which sugars 43.4g) Fibre 1.1g, Protein 5.7g, Salt 0.26g, Sodium 102.7mg.